The last reservation of this item will conclude on June 28. For rentals that require shipping or a pickup at a non-headquarter location, please select a later date for your arrival. Headquarter offices are the only locations that can accept a same-day reservation, as transit time is not calculated in this date. 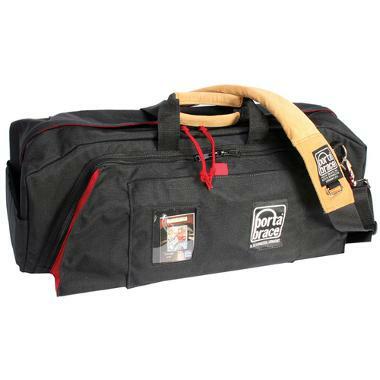 The Porta Brace RB-3 Lightweight Run Bag is designed for news and production crews. The bag stores spare memory cards, batteries, cables, microphones and other audio/video accessories. The main compartment is foam padded with a padded rigid bottom. Two sewn-in dividers span the 7.0" width with a 12" divider in between. The long divider has a zippered slip pocket. On the outside there are two large zippered compartments for cables or other items. Fold them out of the way for one large compartment. he RB-3 has a zippered facing to keep even more water out, should the case be left out in the rain. It is carried by straps with suede leather grips, and a suede leather, medium-duty shoulder strap. A bottom layer of Slip-Not water-barrier fabric with an easy wipe-clean surface has been added. 1000 denier Cordura bag made to carry spare tapes, batteries, cables, microphones and other audio/video accessories. Two dividers are sewn into the bag on one side and they hinge and attach to the other side; this creates a center compartment. An included 12" center divider can be attached to partitions to create two longer compartments.